My sister and brother-in-law have created the cutest room for their little boy. I hope you don’t mind me sharing it with you. It all started with a gray and orange comforter set that she found at Shopko. 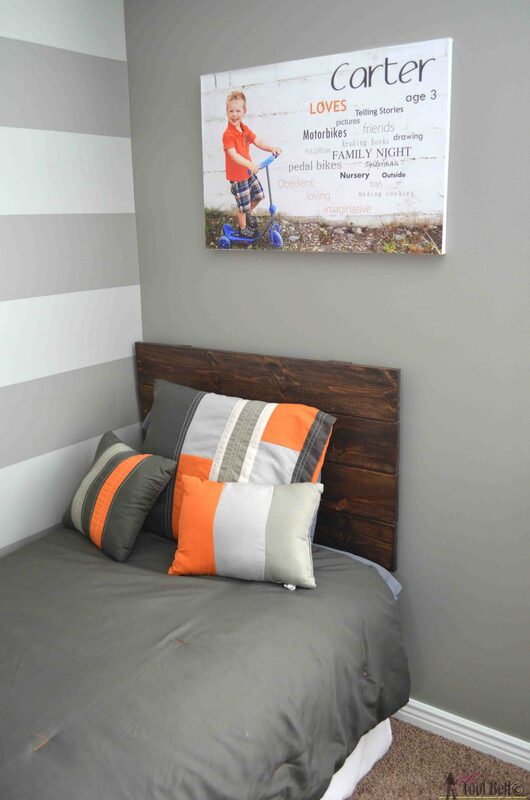 From there, she envisioned a gray room with a gray stripe accent wall. My brother-in-law is very creative and previously worked in a sign shop. 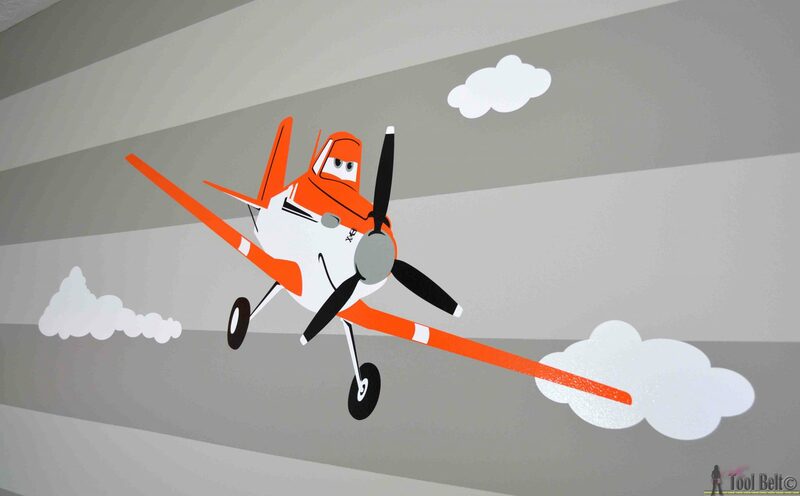 He designed a vinyl airplane inspired by the racing legend Dusty Crophopper (or Strut Jetstream:-)) I think that he did a pretty awesome job! My sister created a favorites thing sign of her little boy, which is just darling. To finish off the bed, they needed a headboard. 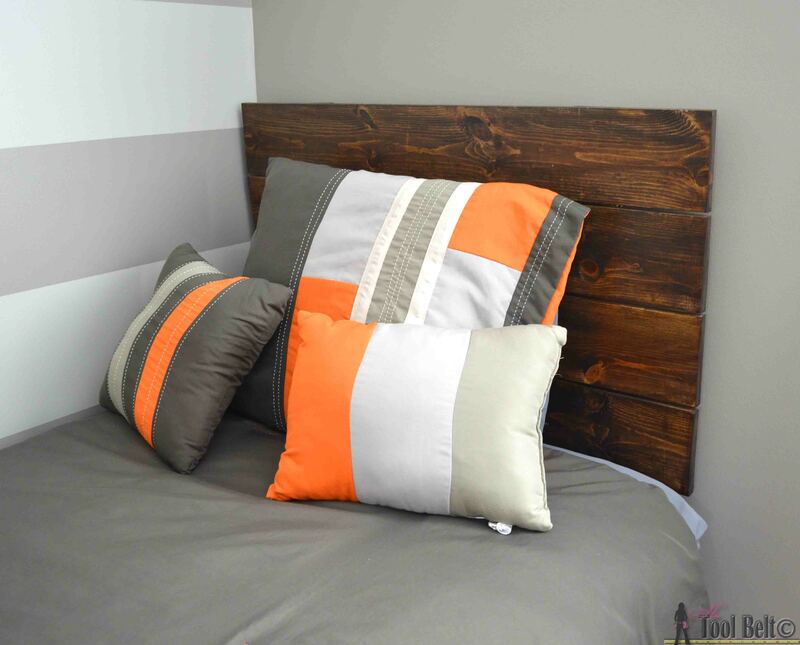 They came up with this simple headboard, it is easy to build, cheap and will add that finishing touch. Cut the 1×6’s into 4 pieces that are 37 1/2″ long. Cut the 1×3 into 2 pieces that are 30″ long and 2 that are 12″ long. On the 30″ pieces drill pilot holes for screws to attach each of the 37 1/2″ boards. 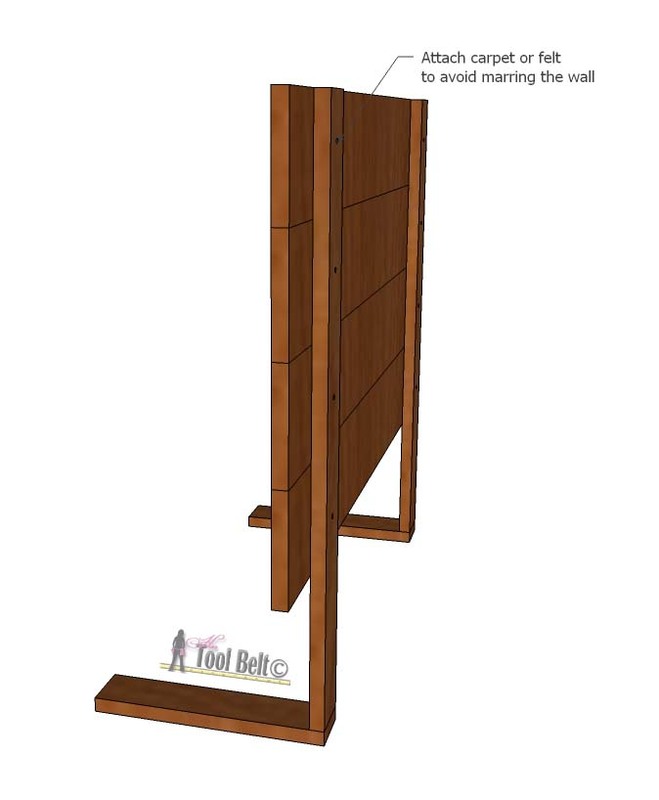 Apply a little wood glue and attach the 30″ pieces with 1 1/4″ screws to the 1×6’s about 4″ in from each side. Leave a small gap between planks for a more defined plank look. Drill pilot holes about 3/8″ from the ends of the 12″ pieces. 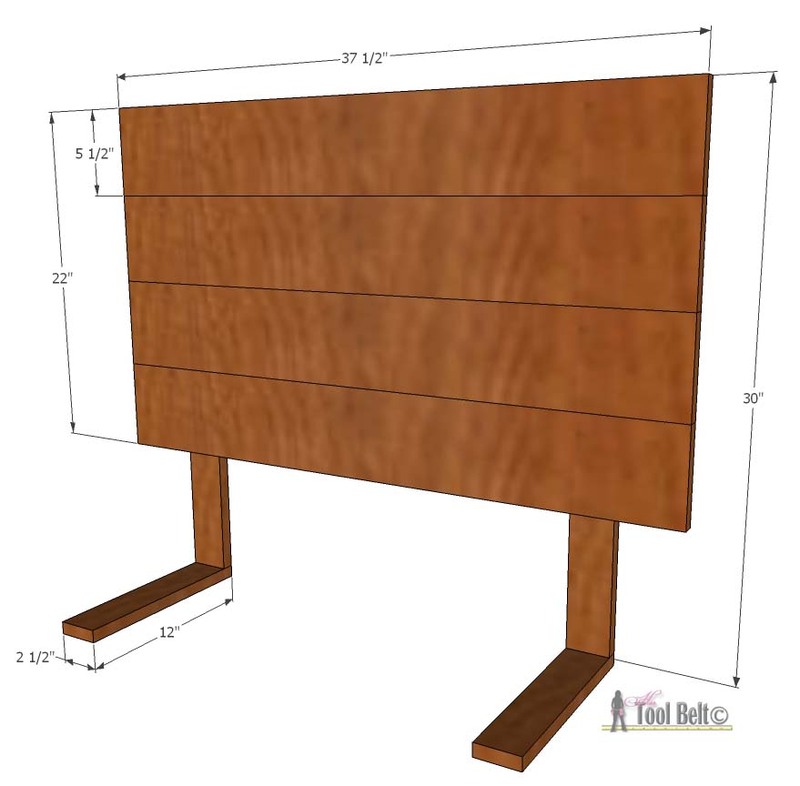 Use wood glue and 1 1/4″ screws to attach the 12″ pieces to the ends of the 30″ pieces. 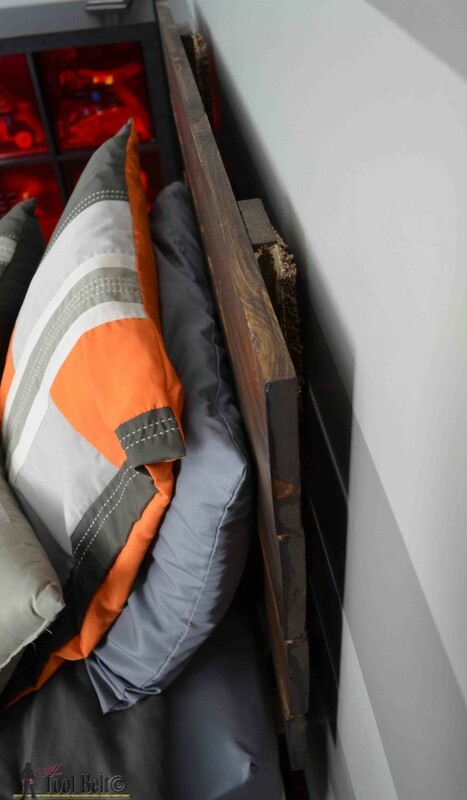 The 12″ pieces (feet) slide between the mattress and box spring to stand the headboard up. Attach a small remnant of carpet or felt with glue/staples near the top of the 30″ pieces to avoid marring the wall. 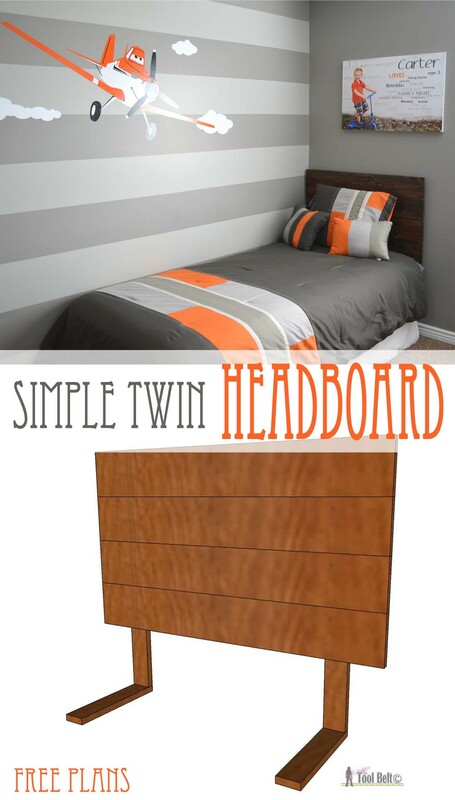 Lightly sand the headboard and finish with 120 grit or higher sandpaper. 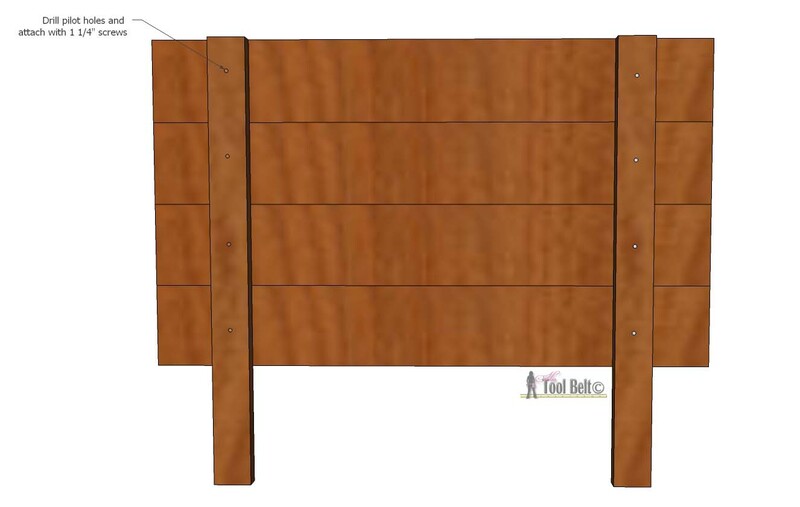 Apply stain or paint as desired (Minwax Espresso was used for this headboard). Once the stain is dry, apply polyurethane topcoat. Ok! Hands down adorable! I LOVE this headboard so much. I really want to make something like it for our rooms. It looks so much better than any you could buy! I love the theme of the room too. Thanks for sharing! Love this room! The stripes on the wall look stunning and I like his portrait hanging above the bed! Well done! This is awesome! 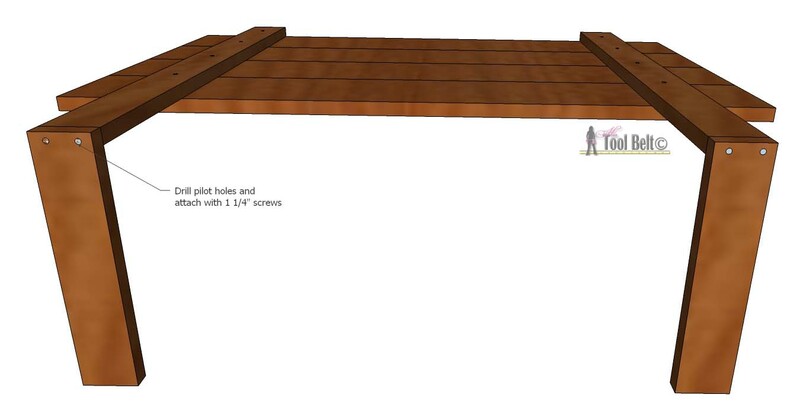 Do you think you’d need another support piece for a queen size? We’re in desperate need of a headboard in our guest room . 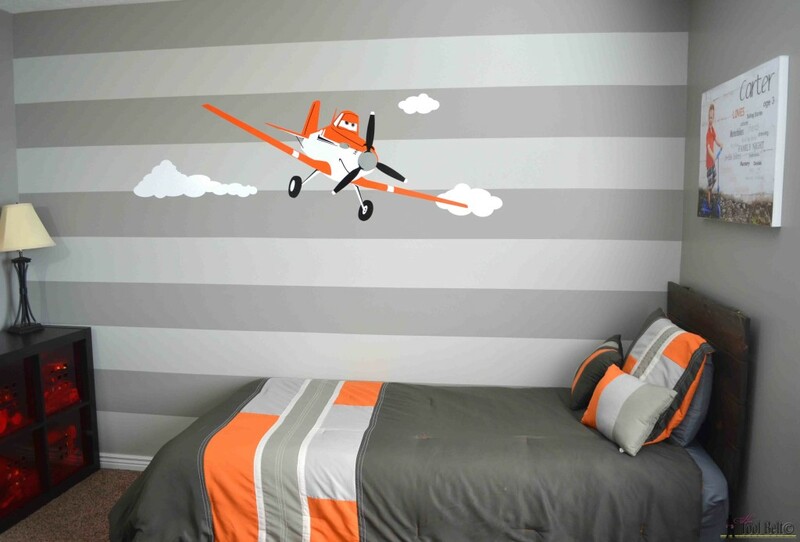 And I love the airplane and color choices 🙂 too cute! Yes, I’d go with one or two more that are spaced evenly along the back. Very cute! What a very clever headboard! I love it! This is the cutest boy themed room!! I love the decal, and that headboard is perfect for the room. So easy to make, too! OH MY GOODNESS is this an adorable bedroom! I love that headboard! I have a little 3 yr old too who needs an updated room (and just so happens to love Dusty too) so thanks for the inspiration! What are the paint colors names/brands you used for the stripes? The light gray stripe is Sherwin Williams 7658 gray clouds. She can’t find the dark gray, but thinks a similar color just 3 or 4 times darker. Very cute room! Where did you get the bed spread? What brand is it? I don’t know the brand, but the bed spread came from Shopko.